All his life, Florent Schmitt was an inveterate traveler … but we think of his globetrotting primarily in connection with the Mediterranean Region, the Middle East and South Asia. And in fact, the composer was to travel to North America only one time his life – in 1932 at the invitation of his friend Serge Koussevitzky, conductor of the Boston Symphony Orchestra. Maestro Koussevitzky had commissioned Schmitt to write a piano concerto to commemorate the BSO’s 50th anniversary, a work he composed in 1931 and premiered with the orchestra in Boston on November 25, 1932. Schmitt played the challenging piano part himself. 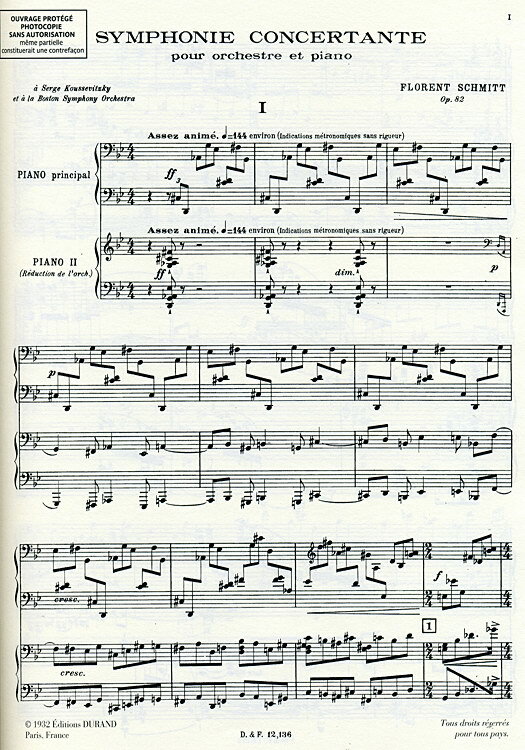 This piece stands as a unique composition among the composer’s works. Carrying the opus number 82, it represents a clear break from the style of Schmitt’s earlier works – far more modern, even dissonant. It’s an amazing piece of music. It is also less immediately “approachable” than most other works by the composer, and for some listeners the jagged harmonies and spikey rhythms will come as a surprise. Indeed, at the time of its composition more than one person dubbed the piece the Symphonie déconcertante (“Disconcerting Symphony”) for precisely that reason. But if you listen closely and allow yourself to become enveloped in the grand musical fresco that Schmitt has created, you’ll discover an inventiveness and brilliance that is tremendously rewarding on an emotional level. Piano reduction score for Florent Schmitt’s “Symphonie Concertante,” dedicated to Serge Koussevitzky and the Boston Symphony Orchestra. Schmitt himself performed the difficult piano part at the Boston world premiere. Speaking for myself, I find new musical nuances every time I listen to this work, and I’m continually amazed at the rich palette of colors the composer conjures up in the orchestra: great blocks of sound that are nothing short of awe-inspiring. Jean-Christian Bonnet, a classical music connoisseur who is an evangelist on YouTube for French classical composers, is quite keen on the Symphonie Concertante, remarking that it is “a highly original work that sits at the crossroads of different influences – very modern in its style yet very romantic in its mood.” I agree completely with his assessment. Like many of Schmitt’s scores, the Symphonie Concertante is fiendishly difficult for both the pianist and orchestra players. This fact may have conspired to keep it from becoming standard concerto repertoire, although we do know that a number of important conductors chose to program the work in the years following the Koussevitzky premiere including Désiré Defauw, Désiré Inghelbrecht, Dmitri Mitropoulos, Pierre Monteux and Paul Paray. Even better for us, the one recording that’s ever been made of this music is mighty fine. 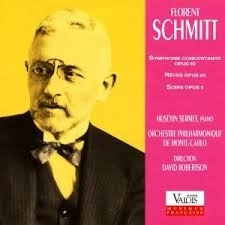 Only commercial recording: Pianist Huseyin Sermet with David Robertson and the Monte-Carlo Philharmonic. From the opening explosion of sound to the thrilling flourish at the end, you will not be disappointed — or so I think. But I welcome your comments and observations about the music. This entry was posted in Classical Music, Composers, French Composers, Piano Music, Uncategorized and tagged Bonnet, Boston Symphony, Classical Music, David Robertson, Deuteurtre, Florent Schmitt, French Composers, Gunnar Frederikson, Koussevitzky, Nones, Sermet, Symphonie Concertante. Bookmark the permalink. « Musicologist Dr. Jerry Rife talks about his introduction to Florent Schmitt’s music. I have to admit that it took me several hearings before I could fully grasp the value of this outstanding and highly complex work. I was familiar with Schmitt’s earlier works and this “concerto” came as a shock to me. Although the second movement with its lush harmonies went directly to my heart, the third movement slowly grew on me and became one of my all-time favourites. The percussive sound and the extremely exciting rhythms are a pure wonder and require huge stamina from the soloist. Thanks again for your kind words about my YouTube channel.